In 1974 Linda Quiring moved to Salt Spring Island, British Columbia to 'find' herself. Salt Spring Island was one of the centers for the counter-culture movement in Canada; home to hippies and back-to-the-landers. Soon, Linda encountered an enlightened man, Sydney Banks, and became his first student. 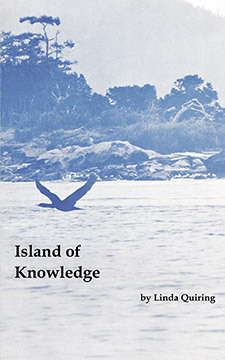 Together they wrote Island of Knowledge under Linda's authorship, detailing Syd's teachings and the profound changes those listening experienced in their lives, health and relationships. Sydney Banks would ultimately become renowned for his revelation of The Three Principles inherent in those teachings. Linda and Syd remained friends until his passing in 2009. Before his death, Syd approached Linda about the possibility of getting Island of Knowledge republished. However, embarrassed by the 'hippy' jargon of the 1970's, Syd asked that references to the times be changed. In deciding what should be left in, what changed, and what taken out, Linda and her publisher realized the book was in fact an important historical account of an amazing time and place and that to tamper with the integrity of the book would be a great disservice, thus it is republished exactly as is. Linda Quiring and her husband Bill live on a small farm on Salt Spring Island, British Columbia where they grow heritage apples and keep bees. Recently retired after 35 years making Artisan soaps and body care products, Linda is the author of Island of Knowledge and Beyond Beliefs: The Lost Teachings of Sydney Banks, and is working on her third book. This book can also be purchased from your local retail bookstore. Mention the title, author and/or ISBN 978-1-77143-198-9. Google Play, Apple's iBookstore/iTunes, Barnes & Noble's Nook, Kobo Books, etc. For wholesale discounts or large volume orders please contact us.